I. Ingratitude is a very cruel thing. It imprints a deep wound on the human heart, and the heart of Jesus was infinitely more sensitive than ours. He had raised Judas to the high rank of the Apostolate; He had made him one of His closest friends and had entrusted him with the secrets of His infinite love. Now Judas betrays Him for the wretched sum of thirty pieces of silver. Worse is to follow, however. While Jesus is praying and perspiring blood at the thought of the ingratitude of men and of the nearness of His passion and death, the garden of Gethsemane becomes suddenly aglow with torches and reverberates with the shouting of the hired ruffians whom Judas has brought with him to arrest Jesus. The treacherous Apostle comes forward. He embraces our divine Redeemer, hails Him as his Master and greets Him with a sacrilegious kiss upon the cheek. Jesus neither repulses nor rebukes him, but with a gesture of infinite mercy He addresses him as a friend. Friend, He says, for what purpose hast thou come? (Mt. 26:50) Dost thou betray the Son of Man with a kiss? (Lk. 22:48) If only Judas could have heeded this last appeal and begged for forgiveness at Jesus' feet with tears of repentance ! Jesus would certainly have taken him to His heart and returned his kiss with a kiss of pardon and divine friendship. Perhaps we have also stood at times on the brink of sin and have been aware of a higher appeal to go back. But have we heeded it? If ever we are in grave danger again, let us listen to this quiet voice which speaks to our conscience. Let us fall on our knees before Jesus and earnestly implore Him: Be not silent, Lord, be not far from me! (Ps. 34:22) Let us ask Him to have pity on our weakness and to come to our assistance. 2. It is quite certain that Judas did not commit this sacrilegious act of betrayal on the spur of the moment. Evil, like goodness, is arrived at step by step. Perhaps it was some motive of self-interest rather than of pure love which led Judas to become one of Jesus' Apostles. Covetousness, the root of all evils, (Cf. I Tim. 6:10) seems to have been his dominant passion. As the Gospel tells us, he kept the money offerings which those who had been converted gave to Jesus for His support and for that of His Apostles. He did not know how to suppress his dominant passion at times. On one occasion he complained about Mary Magdalen when she anointed the feet of Jesus with precious ointment. The passion grew and he became a thief. He was a thief, and holding the purse used to take what was put in it. (John 12:6) In spite of the extraordinary graces he had received, he fell into sin. Finally, he was guilty of the betrayal, of the sacrilegious communion at the last supper, and of the kiss of hypocrisy in Gethesemane. The example of Judas is a lesson to us. It is disastrous to begin to yield to our passions and to fall into evil habits. The Holy Spirit warns us that anyone who makes little account of small things will fall into bigger. (Cf. Ecclus. 19:1) Let us remember that even a tiny spark can set off a conflagration. Likewise, a single mortal sin can lead us to Hell. 3. Failure to comply with the extraordinary graces which Jesus had granted him was responsible for the fall of Judas. Whoever receives a great deal must give as much. 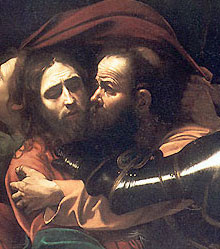 Judas had been called to the dignity of the Apostolate. At the Last Supper he received the fulness of the priesthood along with the other Apostles and received Jesus Himself into his soul under the species of the consecrated bread. In spite of all this he deserted and betrayed his Master. What about us? Let us consider how many spiritual and temporal graces God has bestowed on us throughout our lives. Have we been thankful for them? If we have not corresponded generously with all these favours, or if we have done worse and have rejected them by sin, let us repent and resolve to do better. The example of Judas should teach us this lesson.